Well, I've finally done it! I've designed all my Star Wars amigurumi to my satisfaction, written up the patterns, photographed them, put the patterns together and put them all on Etsy! I've been working on these little Star Wars guys on and off for a couple of years. 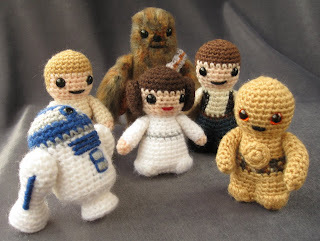 Partly inspired by my and my children's love of Star Wars, and the way Star Wars Lego looks so cute, I realised that I wanted to crochet mini versions of all my favourite characters. It's taken so long because of wanting to keep them stylistically similar even though the characters are very varied. I also wanted them to be different sizes, so that Leia is taller than R2-D2, and Vader is taller than Han, for example, but not perfectly proportionally, or Chewie ends up being too tall. As it is, Yoda is 2.5" tall and Chewbacca is 4.5" tall, with the rest fitting in between them. I made Yoda first, he's pretty simple and easily identifiable, then Leia (my favourite character, the one I identify with) whose iconic hairstyle is perfectly suited to be reproduced in crochet. Neither of these two had legs, Yoda with his robe and Leia her dress, so when it came to most of the other characters I wasn't sure how to make them. I knew I wanted them to have big feet, and to stand up easily, and so I made them without separate legs, but simply defined them with yarn afterwards, a solution which I'm really happy with. Some of them took longer than others to perfect. I wasn't sure if C-3PO would work, but I was happy with him straight away. Vader, on the other hand, I just couldn't get right. His head, his face mask, how much detail to give him. Since his costume is almost entirely black it's very hard to define any details. I made him several times with a flat triangular mask and it wasn't until I made it more three-dimensional that I was satisfied. The Ewok was tough, too. I made him in a completely different way with his hood as part of his head, which I thought I liked, but when I came to write the pattern up it just seemed too unnecessarily complicated. since I'd just been making my crocheted cork knights I realised I could use a similar technique to make a simple separate hood, which I much preferred. 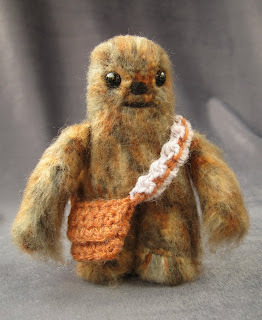 Apart from fine-tuning his height, I liked my Chewbacca, which I made with an alpaca mix yarn then brushed, but I realised that finding that particular type of yarn might be difficult. So I also made him using a normal smooth acrylic yarn that had various different browns in it and which brushed up just as nicely with a wire pet brush. Anyway, I'm very happy with the finished patterns. If they prove to be popular I'll have to work on some more characters - I think I'll do Boba Fett and Obi Wan next. If you want to see more photos, check out my Flickr (http://www.flickr.com/photos/96575205@N00/), and if you'd like to buy any of the patterns just go to my Etsy shop (http://www.lucyravenscar.etsy.com/). Not all these patterns are available for sale now, as they are going to be included in a new Star Wars crochet book, due to be published Spring 2015. I'm a crochet pattern designer who loves creating cute amigurumi animals, and creatures and characters inspired by my geeky interests. I sell the patterns I design in my Etsy shop and I've had patterns published in several magazines. I have had three books published - Star Wars Crochet, Star Wars Even More Crochet, and Hollywood Crochet - and I have many free patterns available here and on Ravelry. OMG, I've just gotta share this too! These are amazing! I made my boys a Yoda a few years ago, but he was no where near this good. You are one talented crochet-er! WOW! Just what I am looking for. I plan to buy the patterns and make these for my boys for their Easter Baskets. 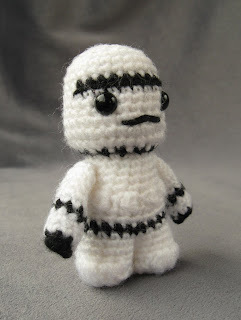 I LOVE these...maybe now I will be inspired to learn to crochet! Wow! These are absolutely wonderful. They combine a love of, well, everything I love! Thank you so very much for these. Thanks for all the lovely comments guys! I'm really pleased you like them. these are just so awesome! LOVE it! i'm from brasil... how can i buy it? I am only selling the patterns (instructions on how to crochet), not the figures themselves. I sell the patterns on Etsy (http://www.lucyravenscar.etsy.com) and I send them out as PDF attachments via email. I just bought a copy of the Darth Vadar and R2D2 patterns to make for my OH :-) I love them!!!!!! OMG!! These are the most fantastic little crochet creatures I have ever seen. I love the Ewok!! Thanks! Have fun making them S! Sorry Anonymous, at the moment I'm working on various other patterns and I'm afraid I just don't have time to sit and make lots of figures. Why not try to learn to crochet? You really only need a hook and a ball of yarn to get started, there are lots of good websites that will teach you and free patterns to practice on. Magnificent realization, I like and my son who is a fanatic of Star Wars also likes your creations. I put a link on my blog for your site. these are really awesome. love your blog! *happy dance* These are fantastic and I love crocheting! Looks like I'll get to learn some new tricks! You are awesome! I LOVE THESE! As soon as I saw them and showed them to my daughter she immediately fell in love with them too. These would just be perfect for my kids! Thank you guys! I've started working on a new set of patterns - the first one is Boba Fett and his pattern is now for sale in my Etsy shop. can't they be free?? i'm only 13 and my parents won't let me buy the patterns. 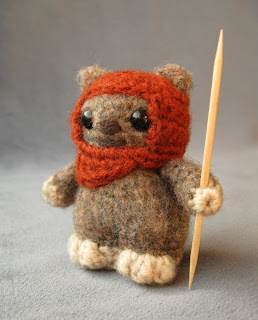 I do have a free pattern for a different version of Wicket the Ewok - look at the list of my free patterns to the right of this page and you'll see it there. Just found these, but I can't locate the patterns...my 30-something sons would love these! How do I purchase the patterns? How much are they? Sorry for the delay in replying, I've just got back from a holiday. they look so cute! specially The Ewok ♥ congrats! These are marvellous! Very creative and well-executed. Lovely work. HI, I love these, found them on pinterest and repinned, but when I checked the source it didn't come back to you. (I'm new to pinterest) I just goggled to find this page. Anyway, I've added this url to my pin, I just wanted to check you are ok with that. If there is somewhere more direct I can pin from I'll delete & repin. Just to repeat, I LOVE these! Thanks Julia, I'm so glad you like them! I know what you mean about Pinterest, sometimes the photos link back to the original image but other times they don't. This is my main blog, and I sell the patterns on Etsy (www.lucyravenscar.etsy.com), so either is good to link to. I've just taken a few more photos of my Star Wars characters to include the newer patterns as well, you can see some of them on Etsy and on Flickr (http://www.flickr.com/photos/96575205@N00/). Thanks! I don't know, I will try to find out. So far, I think the book will be out in May in the US. I don't have definite information for when/if it will be published in other countries yet. I love the book but do you know of anywhere that has a video tutorial how to? I am one of those people who needs a pic by pic guide otherwise I end up with a mess. Thanks Kelly. Sorry, no video tutorials, although there are lots of in-progress shots in the book. Thanks I have the book but I have a very strong feeling I am doing this all wrong. My boyfriend wants me to make him Jabba. I did the eyelids they came out fine. Then I moved on to the head and body as per instructed in the book. Is Jabba's head meant to look like a dolie? I mean when you say change to straw coloured yarn and do it two times do you mean as a single change or totally around the green yarn? As I look at figure B it doesn't seem to be around the whole head, so I think I may have messed up or not understood the instructions properly. Thanks Kelly. It definitely shouldn't look like doily! Check the number of stitches you end up with in each row, to make sure you're not adding stitches where you shouldn't, and try to crochet quite tightly. That might take a bit of practice when you're changing colours and trying to keep the tension even. In each round there's only one section of straw-coloured yarn, for the face, only change yarn colour when it says in each round. If you have an instruction like: "[2 sc in next st, sc in next 2 st] 2 times" you do the instructions in the brackets 2 times. "2 sc in next st" means you're increasing, so work 2 sc into the same stitch, "sc in next 2 st" means you work one sc into each of the next two stitches. Thanks :) Yes definitely doing it wrong! My 7 year old daughter wanted me to make her Wicket and I found out I was increasing instead of decreasing. I usually increase because I made the twi'lek beanie and always needed it to be bigger, I also use a bigger hook than the one provided it's a 4.5mm as I am still learning, and I have Lupus which sometimes makes it difficult to do tedious things in any sort of crafting. I hope you release another book with other characters, I would definitely buy it! I purchased your patterns on etsy and seem to be frozen on the yarn to use. What is your favorite brand and is there one that you would recommend to get the colors/texture that you like to get? I mostly use Hayfield Bonus DK and Robin DK for small amigurumi, which have a good range of colours. They're 100% acrylic, but I sometimes use yarns with a bit of wool in the mix for texture, like Hayfield DK with wool. I get most of my yarn online, from Deramores (http://www.deramores.com/), so even if you don't order from there, it will give you an idea of the colours. 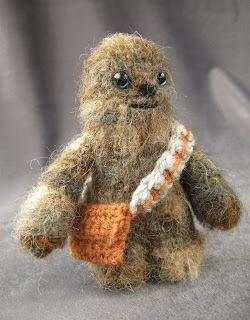 I really want the patterns for Yoda and Chewy, but I can't find them on etsy. Please help? What yarn and size of needle is it in the kit? The yarn is DK and the hook is 3.5mm. I am working on the Yoda from the kit and can't figure out how to get the eyes to work. I'm assuming the white piece goes on the back of the black eye but it won't screw on or stay. Any ideas? Libby, there's some information about safety eyes on the post about the kit: http://lucyravenscar.blogspot.co.uk/2015/04/star-wars-crochet-kit.html. You can also look online for lots more information that might help you if you've never used them before. Excited about kit, got it for Christmas. Making storm trooper and was confused at bobbles used for feet. Are there specific instructions or pictures on how the bobbles are supposed to look when pushed through? Hi Lucy, bought the book and love it. It came with enough yarn to make two figures. 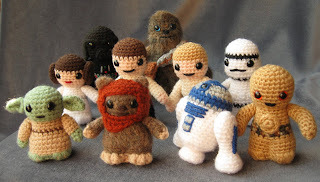 Is there another kit that has all the yarn needed to make the rest of the characters? Kelly - any of the photos of the completed figures show what the feet should look like, but the photo of C-3PO on page 26 (fig. D) shows the feet with the bobbles pushed outwards before the next round has been worked. Thank you Lucy. My second storm trooper should come out even better. Hi Lucy! First of all I bought your book/kit and have to thank you from the bottom of my heart because my 3 boys absolutely LOVE the characters I made for them from it! I do have a question, however: quite a few people have asked me to make some to sell to them (as they cannot crochet), but I wouldn't feel comfortable doing so without asking for your permission first. Please advise! Thanks, again!!! Thanks, I'm so pleased you and your boys are enjoying the patterns! I'm generally happy with people selling items from my patterns, but these patterns don't belong to me anymore, they are owned by the publisher now, so I can't really give permission. That said, I'm sure there is no problem with family and friends paying for materials for you make them. Hi, I have been making these for the past 2 years. The patterns came from a book by Lucy Collin. Thunder Bay Press. Yes, the book has been reprinted in the US and recently released in the UK. It has also been released in Australia/NZ and in a Spanish version. I have made most of the figures, successfully - but have trouble changing colours back and forth for Han Sol0 and Like Skywalker. How do I keep the "hair line" neat.What is the technique? If you have the patterns in the book, the instructions on how to change colours are on page 13. Basically, when you're working on the heads with hair, carry the colour you are not using behind your work by working over it every 3 stitches so that the colour does not show through, but be careful not to pull the carried yarn too tight or it will affect the shape of the figure. It can take a bit of practice to do this neatly. If, with the darker hair, you find it's showing through the skin colour, you can cut the hair colour each time you change to the skin colour, just work over the yarn for a couple of stitches to secure it before you cut. I have the book and I'm either missing something or the book is missing something because I have no clue how to do Yoda's feet. My book says change yarn and when I turn the page its starting the robe and no more instructions to do Yoda's feet anywhere? So now I don't know how to do his feet ... sad face. I don't see how anything can be missing, the first part of the pattern is printed on page 17, then it continues (including how to make the feet) on the back of that, on page 18. How to make the robe is detailed on page 19. If you have any pages missing, you should contact the place you bought it from, or the publisher. I'm struggling to find yarns to use for these projects. Could you share where you got your yarn please? I would love to know where I can find a video tutorial for Yoda. I bought the set to make him but reading the instructions is hard for me. I am much better at watching, pausing the video, and trying on my own. Is there such a tutorial out there and if so, where? 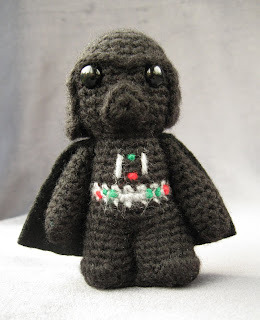 Anything I've found is not from your "Crochet Star Wars Characters" set. Thanks! 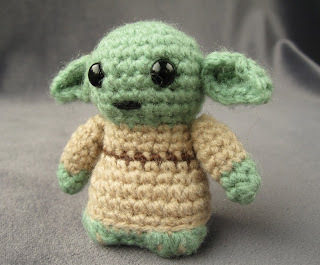 I'm afraid I can't do a video tutorial for Yoda, the pattern belongs to the publisher now and they would have to authorise it. However, I do intend to work on video tutorials for some of my free patterns, starting with a couple of simple ones that might help with the basics of other patterns. Have already done this set and am working in the second set, even more Star Wars crochet. I am finishing Rey and find that the headgear doesn't fit over the hair loops/braids?? I used the same yarn, pattern and hook, any suggestions or reason why it won't fit without completely smashing the hair pieces? Anyone help please? do you have a video of instructions-trying to follow the book directions and have never crochet. Having difficulty with the rounds. I would really like to make these for my grandson. It would be helpful if I could see a video of someone doing the steps. tHANK YOU. Star Wars Even More Crochet is here!